I just got the advance copies of this in the post. It’s written by Caroline Stills. It’s a counting book for little children. I’m very happy with how it looks. I think it will be published (by Little Hare Books) in July. 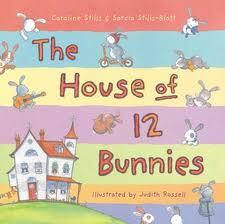 This is my plan for the 12 different bunnies in the book. I tried to give each one a different personality, and this helped me keep track of them all!